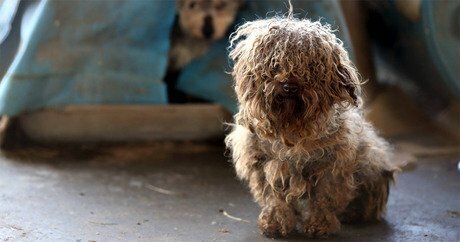 Last week, authorities seized 121 dogs and more than 60 other animals from a suspected puppy mill in Jefferson County, Arkansas, about 30 miles south of Little Rock, The Humane Society of the United States (HSUS) reports. The bust is being called the largest in Jefferson County history. The Jefferson County Sheriff’s Office served a search warrant to Jefferson County residents James and Tara Best last Thursday after reports of sick and neglected animals on their property. The HSUS was one of several organizations called to the scene to assist after the local authorities found the animals living in deplorable conditions. Animals were found living in outdoor kennels or locked in trailers on the property with no access to clean drinking water or food, and all were covered in their own filth. Many were sick and grossly underweight, says Humane Society of Saline County employee Julie Patton. “On a body score of 1 to 9 — nine being the fattest dog and one being the skinniest, most emaciated — this was a one,” Patton explains, referring to a small malnourished dog. “When I opened the door, there was an overwhelming smell of ammonia from the urine and feces on the property,” Jefferson County Sheriff’s Office spokesperson Major Lafayette Woods, Jr., tells USA Today. “Not only was it in the cages and the living areas of the animals, but it was also on the floors.” HSUS spokesperson Dale Bartlett was present during last week’s raid and calls it an unforgettable experience. “I held dogs that were trembling and shaking and with heavy mats,” he remembers. “One looked like there was something wrong with its jaw.” In addition to the 121 dogs recovered, authorities also rescued 11 exotic birds, 19 chickens, 20 horses, and a number of cats, rabbits, and turtles from the 40-acre property. Daniels admits she knew her neighbors were selling puppies under the business name “Busy B Pets” because people would often stop by her place to ask directions to the kennel. In fact, it was a number of these people, potential customers, who contacted the authorities only one month ago to report the horrors they’d seen at the Bests’ breeding facility. Mr. and Mrs. Best pleaded not guilty to multiple charges of animal cruelty in a district court hearing Friday morning, but their trouble is far from over, Woods insists. If the Bests hope to reclaim their animals, they have 15 days to file a petition with the courts and they will have to fork over $90,000 — the amount of money it will cost to care for all of the seized animals. “We fully anticipate the charge to be upgraded based on some of the animals there on the property. Likely, that they will be upgraded to a felony charge [of] aggravated cruelty to animals,” Woods adds. While the Bests’ case plays out in court, the animals seized from their property are being given the TLC they so desperately need. Teams of veterinarians are treating them for various skin, dental, and eye ailments, among other health conditions. PetSmart Charities has donated food and other needed supplies to help care for the rescued dogs. Meanwhile, animal advocates in the state of Arkansas and across the country are calling for tougher animal welfare laws in The Natural State. Currently, the state has no laws against puppy mills and no laws that require breeders to register as a business or receive yearly facility inspections. As a result, unscrupulous commercial breeders have been given free reign to do as they please in Arkansas. “It’s a huge issue here. Arkansas is absolutely one of the leading puppy mills states in the country,” Bartlett tells ArkansasMatters.com. But the tides could soon be turning. The HSUS plans to work with Arkansas state leaders to beef up legislation during the 2015 session.